The chief of the the legislative arm of the European Union said in his address in Belgium that personnel in Frontex, the EU’s border protection agency, should be increased from its current level of 1,260 by 2020. In a wide-ranging speech, Juncker spoke of improving procedures for the return of immigrants whose European asylum applications were rejected. He also called for building reciprocal relationships between the EU and Africa, including a free trade pact. “We need to invest more in our relationship with the nations of this great and noble continent,” he said. “And we have to stop seeing this relationship through the sole prism of development aid. Such an approach is beyond inadequate, humiliatingly so. 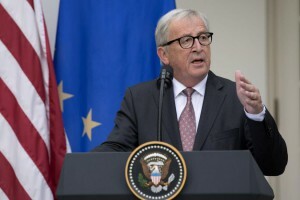 Juncker also expressed frustration with the EC’s policy of allowing a single member state’s dissenting vote to block EU policy, and called for qualified majority voting in specific areas. The EC chief’s speech noted the rise of populism and far-right governments, and suggested a pan-European view of patriotism. While opinion surveys indicate that more Europeans view the EU favorably, residents are also becoming more sympathetic toward nationalist political parties skeptical of the 28-member union.